5 One Piece Guide Rod: Fits flush with the slide so you can turn the bushing to disassemble the gun. This guide rod also features a takedown hole. 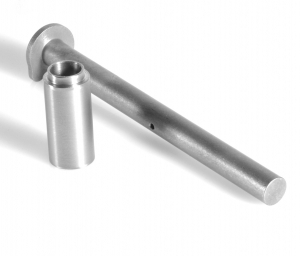 This tungsten guide rod should be checked by a gunsmith familiar with the 1911 design. It may require minor fitting to contact the frame evenly. Failure to do so may lead to premature wear and/or breakage which will not be covered under warranty. The STI Guide rod is made specifically for a STI model as the button on the end of the guide rod is smaller in diameter than a standard guide rod. Check for fit in 3 areas: (1) Barrel feet should not contact head (2) Where guide rod rests against frame (3) Back surface of slide/dustcover is flat and even.